As a blogger I am a slacker, so a quick catch up for my Nov 18th post. 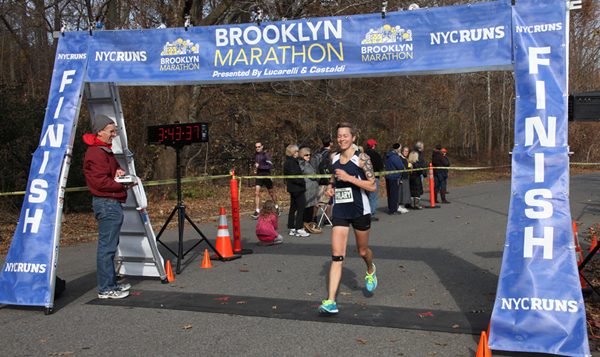 After the NYC marathon was cancelled I got invited to run the Brooklyn Marathon, a 9 loop course in Prospect Park in Brooklyn, NY. I had not idea how it would go. I ran a 10 mile race in this park and it about killed me. There is one long one mile uphill, but of course that leads to a downhill on the other side. Briefly the loop course is my friend. I loved the loop course. I met up with my buddy Amy Copper and we decided to run together. It was a blast. The loops went by in no time and suddenly I was looking at the last six miles when my usual training buddies David and Patrick showed up. I quickly sided up to their fresh legs and focused in to the finish. At one point David asked if I wanted to know how fast I was going, and I simply replied “no” just keep going. I crossed the line at 3:43. 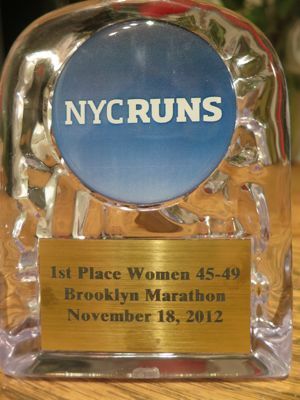 I won my age group by over 18:00 and came in 27th overall woman out of 175. There were a total of 444 people in the race. I was in the top 25% male and female. I am pretty happy about it. Winter I have taken a break but I am now slowly gearing it back up.